Ginger has been used as a natural remedy for many ailments for centuries. Now, science is catching up and researchers around the world are finding that ginger works wonders in the treatment of everything from cancer to migraines. Perhaps no other herb, except garlic, crosses all barriers, foods versus medicine, Western versus Oriental, scientific versus folk tradition. Ginger is a universal herb in all respects. Components of ginger such as gingerol can inhibit the production of prostaglandins possibly more effectively that the arthritis drug domethicin. The root has a stellar reputation for controlling nausea of all types. Studies have shown ginger to be especially effective in curbing motion sickness, morning sickness, and postoperative and chemotherapy-induced nausea. Ginger is an excellent digestive, aiding in the absorbtion of food, and elimination of gas and bloating. 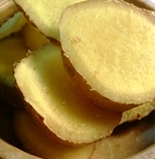 Ginger stimulates circulation so it is good for cold hands and feet. Bread, milk, peanuts, fish and egg-white are healthy foods and give us essential nutrients – but for some people "healthy" foods can cause a range of diseases due to allergies and intolerances to the proteins in these foods. Queensland scientist Cliff Hawkins of Biohawk ,a biotechnology company to help people with chronic food allergies , has developed a technology based on natural ginger that reduces the risk of food intolerances and allergies. Prof. Hawkins was studying the potentially life-threatening peanut allergy, and discovered that many dietary proteins have "proline groups" which the body cannot digest. The immune system becomes sensitized to the proline groups and triggers unfavourable responses such as inflammation, neural irritation, excess mucous production, indigestion, irritable bowel symptoms. He also discovered that many viruses are coated with proline groups, and in fact a person's sensitivity can be increased following a viral infection such as influenza. Unlike other ginger products, Biohawks's ginger is rich in zingibain and other bio-actives which act as highly specific enzymes to cut up potentially dangerous proteins in foods and on micro-organisms like viruses. Once the proline groups are broken up the body can now digest the remaining protein and does not see the protein as an immune threat. Similarly, the zingibain breaksdown the viral coating and allows the immune system to mount a more successful attack on the infection. "Using a natural food source for the enzyme eliminates the immune hypersensitivity to these proteins and it reduces the concentration of particular proteins released during the immune response that cause tissue damage and interfere with normal metabolism." he said. Zingibain breaks down these normally indigestible proteins in gluten, albumin, dairy , nuts and some meats, reducing the risk of adverse reactions to the foods. "Biohawk Digest Easy has been found to provide enormous help with various diseases, including some types of cancer," says Dr Hawkins – a Pro-Vice-Chancellor of the University of Queensland biological sciences division. Some cancers such as cervical cancer have been shown to be triggered by viral infection like human wart virus. Digest Easy is sold as a food but after more tests Dr Hawkins said it would be taken to other levels of registration. "People have been taking our product for a number of years for health reasons and we think we can make a difference , he said. BioHawk is currently involved in clinical trials with Digest Easy, BUT all the products listed contain high levels of "zingibain".